Gulf carriers are continuing to pursue ambitious expansion in Singapore, intensifying competition with Singapore Airlines (SIA). Gulf carriers are steadily increasing their share of the Singapore-Europe market while SIA reduces capacity to Europe. Qatar Airways is increasing capacity in Singapore by 67% in mid-2015 as it introduces a third daily service, while Emirates significantly expanded capacity in Singapore in Aug-2014, when it introduced its fifth daily Dubai-Singapore frequency. Etihad Airways meanwhile is adding Singapore-Middle East capacity by decoupling its Singapore-Brisbane service from Jun-2015. Total seat capacity between Singapore and the Middle East will be up by almost 20% in Jun-2015 compared to Jun-2014. SIA has steadily cut back capacity to the Middle East in recent years while not pursuing any growth to Europe. SIA will now be cutting total seat capacity to Europe by about 4% from 2H2015 as it introduces a premium economy product. The resulting reduction in economy seat capacity could help SIA improve yields in markets facing intensifying competition with Gulf carriers. This is the second in a series of analysis reports on the Singapore market. The first report analysed Singapore Changi’s traffic figures for 2014, which grew by less than 1%, and the slowdown in the LCC sector. This report looks at the Singapore-Middle East and Singapore-Europe markets. Singapore Changi recorded a 2% drop in passenger traffic to Europe in 2014, to 3.881 million. Europe was the weakest performing region for Changi for the second consecutive year. In 2013 passenger traffic between Europe and Singapore dropped by 5.2%. The reductions come despite an increase in European visitor numbers. Arrivals of European residents increased by 2% in the first 11 months of 2014 to 1.48 million, according to Singapore Tourism Board data. In 2013, arrivals of European residents increased by 4% to 1.59 million. 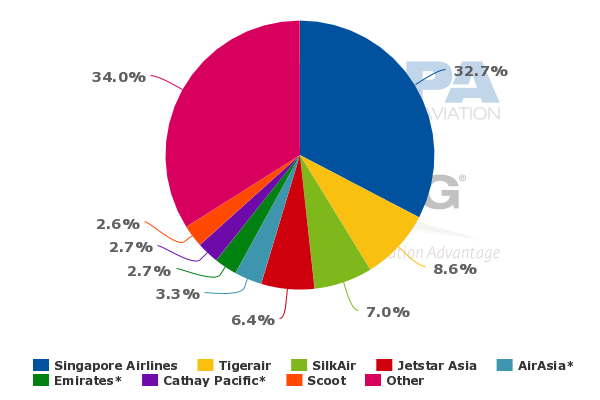 As the Gulf carriers have expanded in Singapore they have steadily increased their share of the Singapore-Europe market – just as they have elsewhere in Southeast Asia. Passenger traffic between Singapore and West and South Asia was up 5.6% in 2014 to 5.9 million passengers, making it the fastest growing of Changi’s regional categories. 2014 marked the first year Changi combined West Asia (the Middle East) and South Asia into a single region. The 5.6% increase in the West and South Asia market likely masks a large increase for West Asia. Seat capacity in the Singapore-South Asia market has dropped slightly over the last year while the Singapore-Middle East market has seen a double-digit surge. Growth opportunities in the Singapore-South Asia market are generally limited by bilateral constraints in the Singapore-India market while there are no such constraints in the Singapore-Middle East market. In Jul-2015 there will be about 46,000 weekly non-stop seats between Singapore and the Middle East, an increase of about 17% compared to the approximately 39,000 weekly seats in Jul-2014. The 46,000 seats includes 38,000 seats from the big three Gulf carriers – Emirates, Etihad and Qatar – compared to only about 29,000 in Jul-2014. SIA and Saudia account for the remaining capacity. Saudia currently operates four weekly flights to Singapore from Jeddah. SIA currently operates only 11 weekly flights to the Middle East, including seven Singapore-Dubai frequencies and four Singapore-Dubai-Jeddah frequencies. SIA dropped Kuwait in late 2011, Abu Dhabi in late 2012 and Riyadh in Sep-2014. In comparison the Singapore-Europe market will have in Jul-2015 about 107,000 weekly non-stop seats including approximately 70,000 seats from SIA. This represents flat capacity for SIA and a slight decrease overall compared to Jul-2014, when there were about 109,000 weekly seats. Singapore-Europe non-stop seat capacity peaked at about 120,000 weekly seats in Jul-2012. 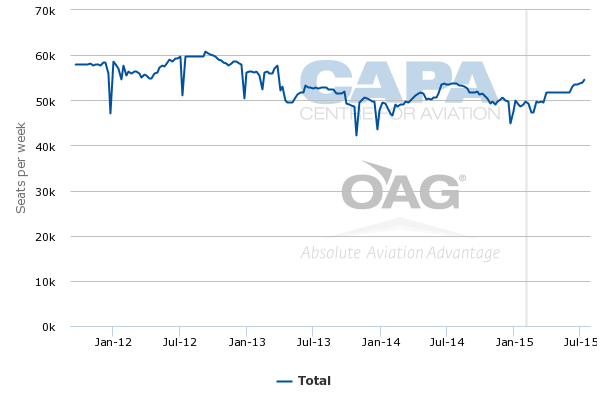 Qantas has accounted for most of the reduction in capacity over the past couple of years. The Australian carrier’s withdrawal from the Singapore-Europe market in early 2013 also partially explains the reduction in Changi’s Europe passenger numbers over the last two years. Qantas previously served London and Frankfurt from Singapore with about 17,000 weekly return seats. But an overwhelming majority of its passengers on these routes originated from or were heading to Australia. Qantas pulled out of Frankfurt entirely while the stopover on its Sydney-London and Melbourne-London flights was moved from Singapore to Dubai as part of a new partnership with Emirates. Qantas’ move to Dubai further underscores the growing role of Middle East hubs for transit traffic between Asia-Pacific and Europe. British Airways, Emirates and Etihad continue to operate flights beyond Singapore to Australia. Emirates currently operates one daily flight on the Singapore-Brisbane and Singapore-Melbourne routes while British Airways operates one daily flight on Singapore-Sydney and Etihad one daily flight on Singapore-Brisbane. But a growing portion of Gulf carrier flights now turn around in Singapore. This provides even more seats for the local Singapore-Europe and Singapore-Middle East markets, meaning in reality the Singapore-Middle East capacity growth is significantly higher than the 17% indicated. Etihad operates only one flight to Singapore but has always served Changi as a stop on its Abu Dhabi-Brisbane flight, which was launched in 2007 and was upgraded to daily in early 2013. Etihad plans to launch non-stop 787-9 services to Brisbane on 1-Jun-2015 while maintaining its daily A330-200 flight to Singapore. While technically its capacity in the Singapore-Middle East market will remain flat at 3,668 weekly return seats Etihad will be able to sell a significantly higher number of local seats to and from Singapore because a large portion of its Abu Dhabi-Singapore passengers now continue onto Brisbane. Etihad will still remain the smallest of the Gulf carriers in the Singapore market but for the first time it will be able to join Emirates and Qatar in aggressively pursuing the Singapore-Europe market. Etihad uses a 262-seat A330 in the Singapore market with 22 business class and 240 economy seats. Emirates was able to bolster its presence significantly in the Singapore-Europe market in Aug-2014, when it added its fourth daily non-stop flight from Dubai to Singapore. The fourth flight, which is operated with 364-seat 777-300s, technically boosted Emirates’ seat capacity between Singapore and Dubai by 29% to about 22,600 weekly return seats. But in reality the growth was significantly higher because a majority of passengers on two of its existing daily Dubai-Singapore frequencies continue on to Australia. With the new turnaround flight the portion of Emirates’ Singapore passengers connecting beyond Changi has been reduced from over 50% to about 35% to 40%. As a result Emirates has seen a significant increase in point of sale activity in Singapore over the last six months, which inevitably has been noticed by SIA and other competitors. Emirates has been able to sell more Singapore-Europe seats and has also boosted Singapore-US sales from a low base as the new flight combined with Emirates’ expansion in the US has opened up more connections. The UK remains Emirates’ biggest connection market from Singapore but Emirates has picked up significant market share between Singapore and New York, driven partially by SIA’s Nov-2013 withdrawal of Singapore-Newark non-stops. It also has achieved growth on a relatively low base in the Singapore-Africa market with Casablanca being a particularly popular connection. In addition to the four non-stops, Emirates operates one daily one-stop flight from Singapore to Dubai via Colombo. But this longstanding flight mainly caters to passengers heading to or from Sri Lanka, limiting opportunities for Singapore-Europe sales. Prior to the launch of the fourth non-stop frequency from Dubai, Emirates for several years had only one flight dedicated to the local Singapore-Middle East/Europe market. This flight was up-gauged to the A380 in late 2012 and is currently Emirates’ only A380 flight to Singapore. Emirates could potentially up-gauge its second Singapore turnaround flight to the A380, particularly if it is able to continue growing its share of Singapore-Europe traffic as well as its partnership with Jetstar Asia. Emirates began codesharing with Jetstar Asia in 2014 and timed its fourth daily non-stop to Singapore to maximise connections to Jetstar Asia-operated offline destinations throughout Southeast Asia. The Jetstar Asia partnership and the additional capacity at Changi further grows Singapore’s status as an Emirates hub for Asia-Pacific but Emirates also sees opportunities to expand its presence further in the local Singapore market. Emirates is particularly targeting a larger slice of the Singapore corporate market, a sector traditionally dominated by SIA. Currently only about 15% to 20% of Emirates’ Singapore revenues are generated by corporate accounts. This should grow as Emirates' connections from Singapore continue to improve and as the airline’s presence at Changi, where it is already the largest foreign full-service carrier with a share of over 3% of total seat capacity, becomes better known. Qatar Airways also expects a significant boost in Singapore-Europe and Singapore-US traffic after it adds a third daily flight to Singapore on 1-Jun-2015. In announcing the new flight on 2-Feb-2015 Qatar cited improved connections to the Americas and Europe. Qatar will also add capacity in the Singapore market by up-gauging from the 254-seat 787-8 to 283-seat A350-900. The third daily flight will be launched with the A350 while the existing two daily flights will transition to the A350 from Jul-2015 and Aug-2015. Once the all-A350 schedule is implemented Qatar will have 11,886 weekly seats in Singapore, a 67% increase compared to the 7,112 seats currently. The Jul-2015 versus Jul-2014 figures (displayed in the chart earlier in this report) shows a smaller increase of 40% because one of Qatar’s Singapore frequencies will still be operated in Jul-2015 with the 787. In Jul-2014 the carrier also still operated one of its two daily flights with the larger 777-300ER. Qatar transitioned one of its Singapore flights from 777s to 787-8s at the end of Mar-2014 while its second flight was transitioned from 777s to 787-8 in Aug-2014. While technically this resulted in more than a 20% reduction in seat capacity, in reality its Singapore-Doha capacity increased because at about the same time Qatar stopped extending one of its Singapore flights to Bali. The new schedule of three daily A350 turnaround flights represents a huge commitment for Qatar to the Singapore market. It particularly is noteworthy as Qatar will be deploying its third, fourth and fifth A350s to the Doha-Singapore route. The first two aircraft are being allocated to the Frankfurt-Doha route. Qatar is currently operating one daily Frankfurt-Doha A350 flight and will transition its second Frankfurt frequency to the A350 on 1-Mar-2015. As a result Singapore will be Qatar’s second A350 destination. Qatar will also be the first carrier operating the A350 to Singapore, beating SIA by about seven or eight months. SIA has 70 A350-900s on order with the first aircraft expected to be delivered in early 2016. Transitioning Singapore to an all-A350 operation should raise Qatar’s brand presence in Singapore as it makes a bigger push into the Singapore-Europe and Singapore-Americas market. As is the case with Emirates and Etihad, SIA will be most impacted as SIA accounts for about two-thirds of non-stop seat capacity between Singapore and Europe. SIA is no stranger to competing with the Gulf carriers across a wide range of long-haul markets including the kangaroo route connecting Australia and Europe. SIA is not about to back down, particularly in competing for premium traffic. But SIA is making a major strategic adjustment by introducing premium economy while reducing economy class capacity. The resulting decrease in capacity on several medium/long-haul routes could help SIA to improve yields and profits in markets that have come under increasing competitive pressure, particularly from the Gulf carriers. SIA in theory will carry fewer low yielding economy passengers to and from Europe, essentially ceding this traffic to Gulf carriers and other aggressive competitors. SIA have unveiled plans to reconfigure 19 of its A380s and 19 of its 777-300ERs with premium economy. All the A380s and several of the 777-300ERs will be retrofitted by Jan-2016 with the remaining 777-300ERs slated to be retrofitted by Jan-2017. SIA also has committed to including a premium economy cabin on 20 of its future A350s but has not yet committed to the product for 50 of its future A350s or a newer batch of eight 777-300ERs (five of which have already been delivered). SIA began selling premium economy on 3-Feb-2015 across 15 routes from Singapore which will be at least partially operated with premium economy aircraft by 6-Jan-2016. Sydney will be the first route, with one of four daily frequencies receiving premium economy from 9-Aug-2015 and a second frequency from 12-Aug-2015. Hong Kong and London will both see premium economy on some flights from 28-Aug-2015. The 777-300ERs are being retrofitted with SIA’s new economy, business and first class seats which were initially introduced on new 777-300ERs in late 2013. SIA is reducing total seat count by only 14 on the 19 777-300ERs that are slated to be retrofitted from 278 seats to 264 seats. SIA is expanding business class from 42 to 48 seats but reducing first class from eight to four seats while introducing 28 premium economy and eliminating 44 regular economy seats. SIA’s system-wide seat capacity will be reduced by about 1.5% by early Jan-2016 as a result of the A380 and 777-300ER retrofits. Most of this is being driven by the change in density on the A380 as the change on the 777-300ER is less and only a small portion of the 777-300ER fleet will be retrofitted by Jan-2016 while the entire A380 fleet is reconfigured by the end of 2015. CAPA estimates the capacity to Europe will be reduced by 4% by Jan-2016 while capacity to North Asia, the Middle East, Southwest Pacific and South Asia will be reduced by between 1% and 2%. London will see the biggest seat reduction (1,036 weekly return seats) as three of SIA’s four London flights will feature premium economy. Frankfurt will have a reduction of 616 weekly return seats in the Singapore-Europe market as premium economy is operated on both of its Singapore-Frankfurt flights. Paris and Zurich, which is currently served with one daily A380 flight, will each be reduced by 420 weekly seats. The 4% reduction in capacity to Europe come as Gulf carriers continue to expand in the Singapore-Europe market. The reductions will also impact several sixth freedom markets where SIA competes with Gulf carriers, in particular Sydney-London. The capacity reductions may seem relatively minor - but they represent a further shift in the competitive landscape for SIA and the Singapore market. The new premium economy product, along with the reduced economy capacity and its ongoing commitment to continue upgrading its long-haul business class product, reinforces SIA’s position at the top end of the market. This is as much a response to European and Asian carriers, several of which now offer premium economy options. But it is the Gulf carriers, which have not yet joined the premium economy bandwagon, that have singlehandedly changed the overall dynamic of Singapore’s long-haul market. There is no end in this battle. The pressure will continue to build as Gulf carriers continue to expand ambitiously in SIA’s home market. And, as always, Singapore Airlines will use the increased tension to hone its competitive skills. The premium economy strategy is a sound one, but inevitably can only be successful in the short to medium term as the competitive cycle continues. In the airline business there is nowhere to hide, but there are always new opportunities for innovative quality companies.